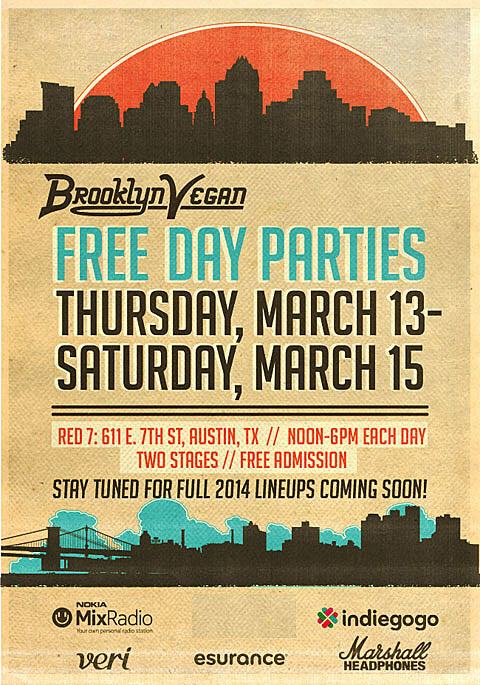 Like our official showcase, the free BrooklynVegan Austin day parties this year will take place at Red 7 on two stages: Thursday, March 13, Friday, March 14, and Saturday, March 15 (noon-6pm each day). Stay tuned for the full lineup announcements and more information coming soon, but meanwhile save the dates! As always, we couldn’t do it without our generous sponsors and this year we are happy to welcome with us Shiner Beers, Indiegogo, Nokia’s streaming music app MixRadio, Esurance, Veri soda, and Marshall Headphones. Follow @BVSXSW on Twitter and you can always check BrooklynVegan.com/SXSW for more information as we announce.